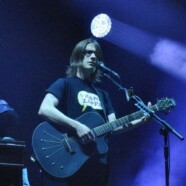 Steven Wilson will return to the road for a brief but high-impact solo tour that sees the musical visionary visiting bigger and more high-profile venues since his last North American trek. Wilson will perform at vaunted venues, such as The Beacon Theatre in NYC and The Orpheum in Boston. The shows are selling at a brisk pace and are expected to sell out, as they have earned “can’t miss” event status for fans of the progressive rock music that Wilson has spent his entire career crafting. Wilson recently released his 4 ½ album, which is an interim release between his recently issued fourth album Hand. Cannot. Erase. and the next studio album. 4 ½ comprises six tracks with a total running time of 37 minutes. Four of the songs originated during the sessions for Hand. Cannot. Erase. and one from the recording sessions for the previous album The Raven That Refused to Sing. The final track is a version of “Don’t Hate Me,” a song originally recorded by Porcupine Tree in 1998; it is based on a live recording made on the recent tour of Europe with additional recording later done in the studio. The vocals on this new version are sung as a duet between Wilson and Ninet Tayeb. Also, Wilson’s brilliant David Bowie tribute has reached nearly a million views on Facebook. Additionally, Kscope will re-release Wilson’s first three solo albums in digipak format on March 4.